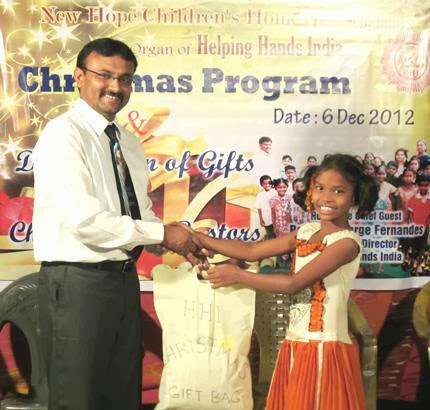 New Hope for Children Orphanage: Share your love and Christ's love with orphans this Christmas! Share your love and Christ's love with orphans this Christmas! Join with us to share the miracle of Christ’s birthday in 4 India orphanages! We invite sponsors, partners, and all those interested in orphan ministry to make a donation to help us buy Christmas gifts for our 136 children at four Christian orphanages under the direction of Pastor George Fernandes. Your gift of $25 will provide a Christmas gift bag and Christmas celebration for one child. This year’s gift bag will include new clothing; underclothing; personal grooming items such as soap, tooth brush, bathing sponge, and comb; a ball; pencils, pens, and eraser; animal toys; toy car; crayons; handkerchief; puzzle cards; and of course… candies! We still have about 40 children who do not have sponsors. Therefore, if you are able to send a donation to help buy gifts for un-sponsored children and children of caretakers, that will bless us greatly! We will receive donations for Christmas during the month of November, and send the funds to India early in December. Or, just click on the GIVE button. Thank you and God bless you for your prayers and financial support!